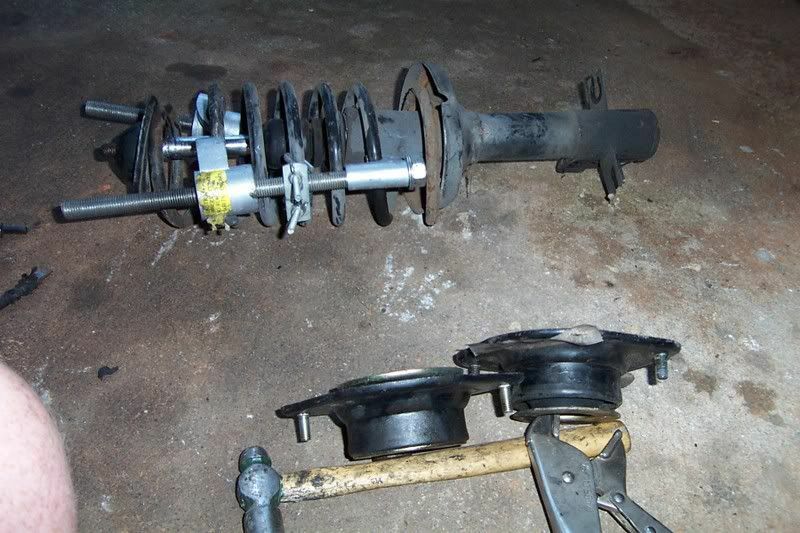 How do you tell your Strut and Mounts are bad? This is a good strut mount beside a bad one. Jack the front of the car. jack in place with almost pressure on it as a safety. disc in sharpie, or on the tool. 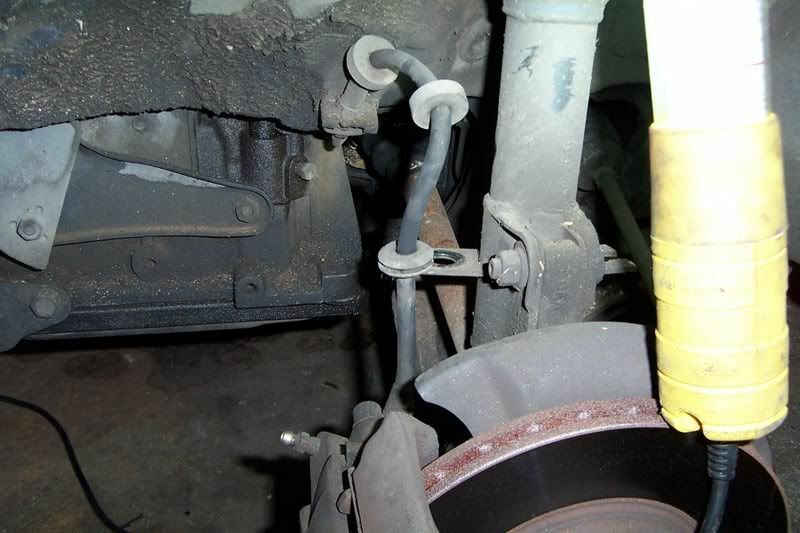 Remove the brake line from the holder. DO NOT PULL ON THE HOSE pry it off. 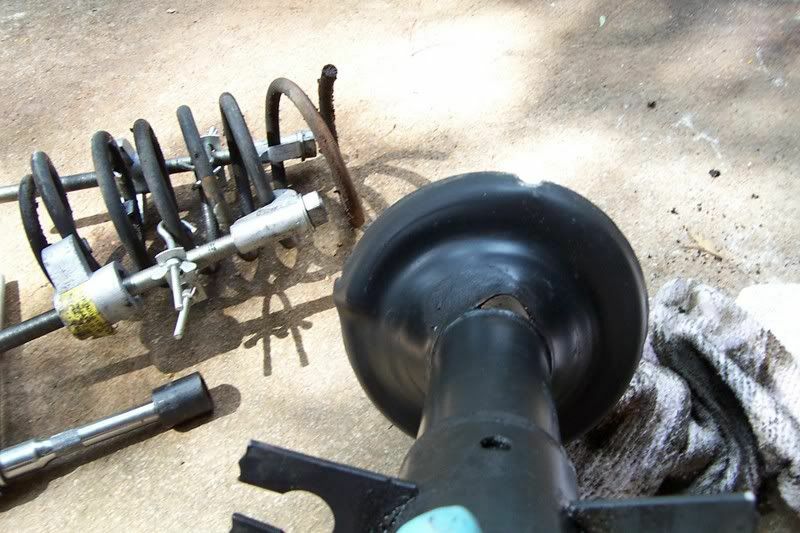 Break the two camber /strut to hub bolt loose. 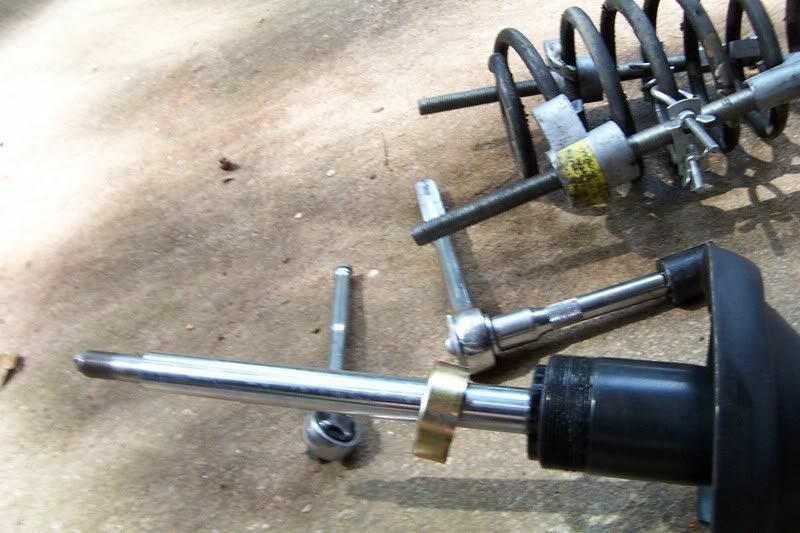 Break the torque on the top strut bolt, DO NOT REMOVE LOOSEN ONLY. 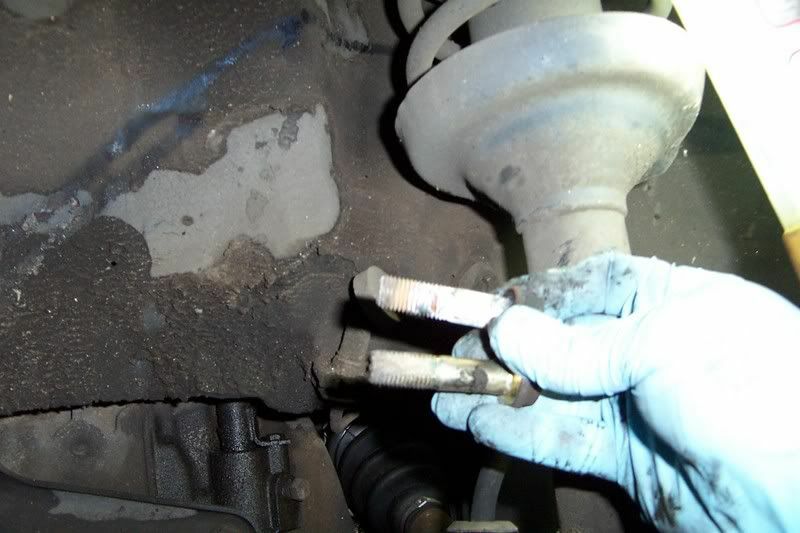 Take the two lower bolts out, you may have to persuade then a bit, leave the nuts on and smack the bolts out…. If the Bolts haven’t been out in a while they can corrode. 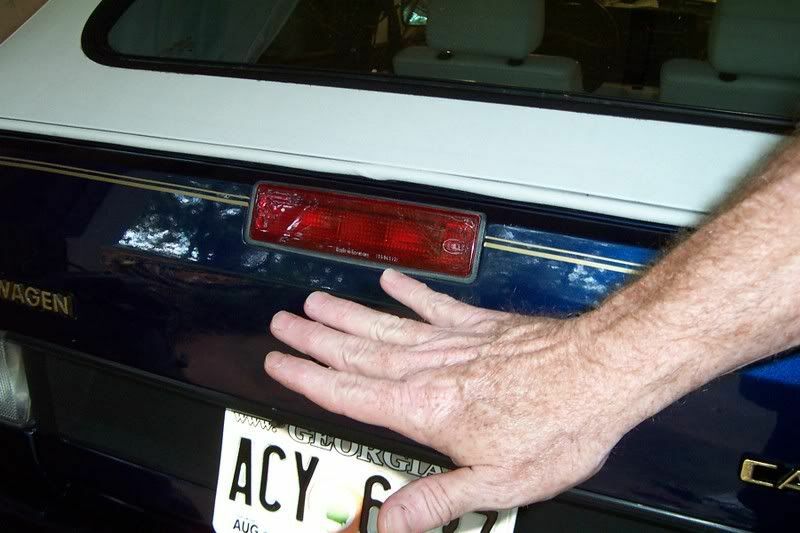 Pull it out of the car…………….. 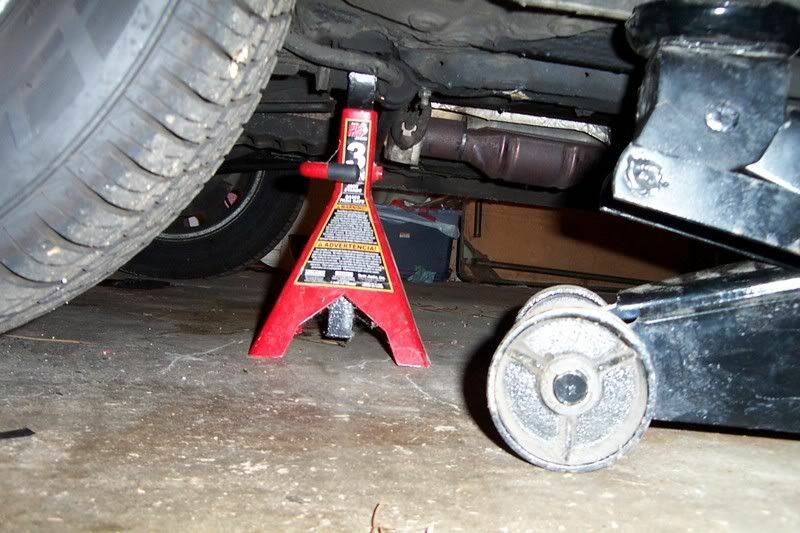 Put your spring compressors on 180 degrees apart. Tighten them equally and when you can put a screwdriver between the top spring seat and the spring, and it moves freely, then you can start to remove the top nut. Good mount Bad mount . 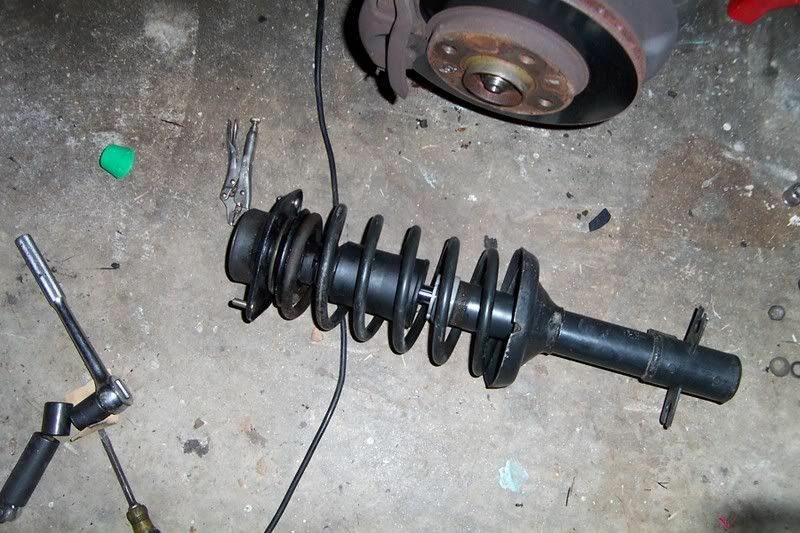 Remove the spring and set aside. See the bad Strut? 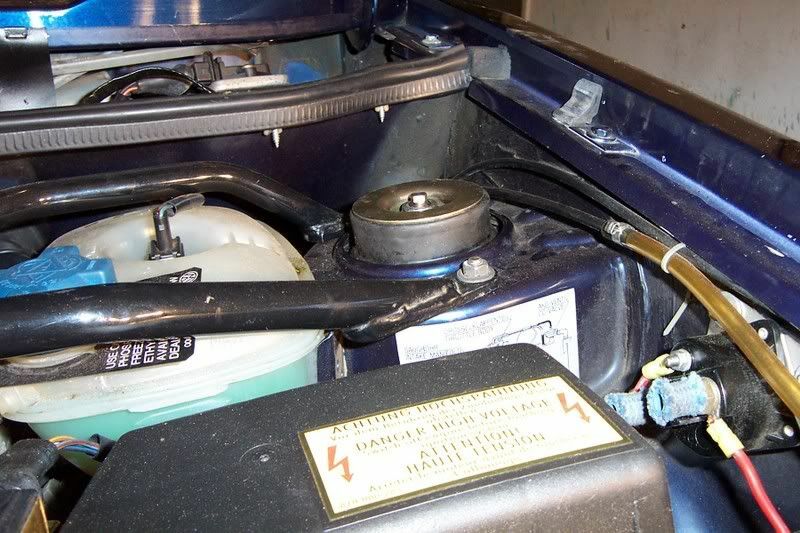 To remove the strut cap nut, if you don’t have a vise…. Place the strut on the concrete and with a drift punch, hit the notched collar counter clock wise. A few good smacks and the collar will come off. 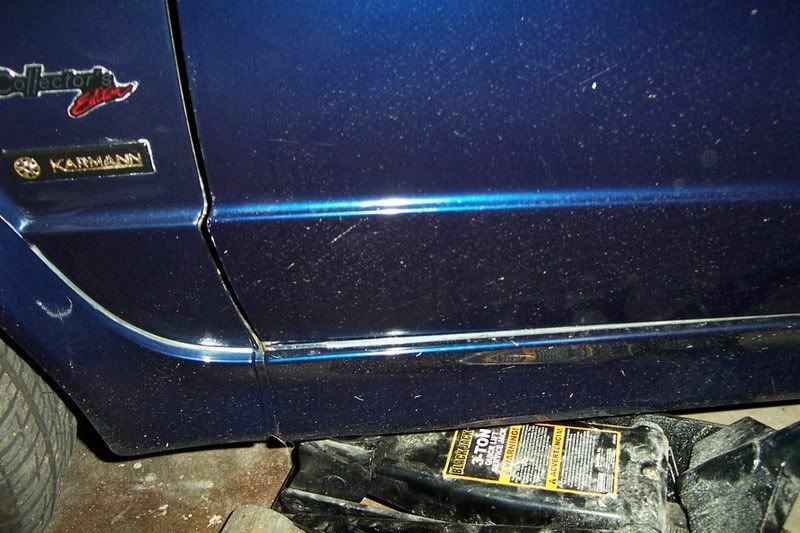 a bad bumper stop /dust cover. 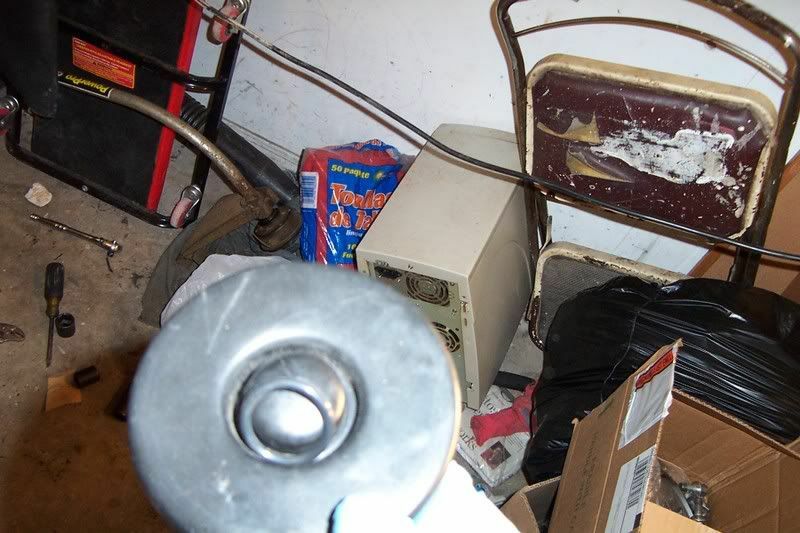 This has an original strut, with the oil filled cart. 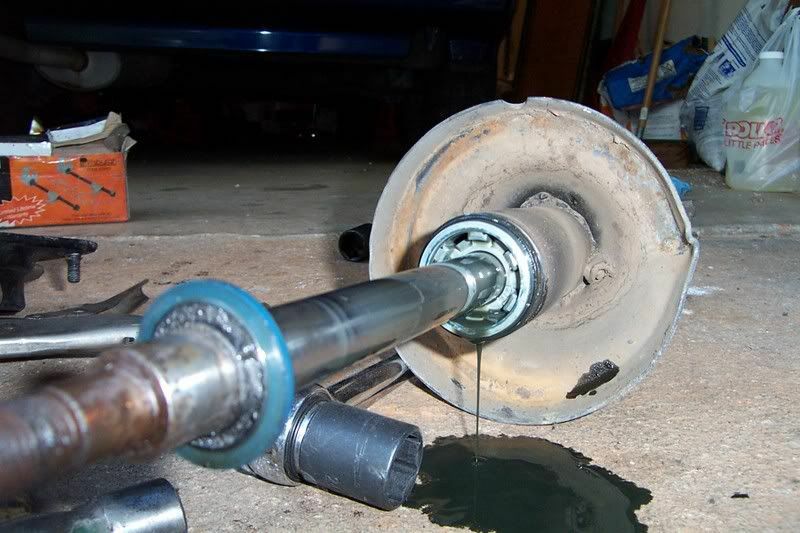 Clean the Strut…. be sure to clean the weap hole too. Insert the cartrigde in to the strut tube. 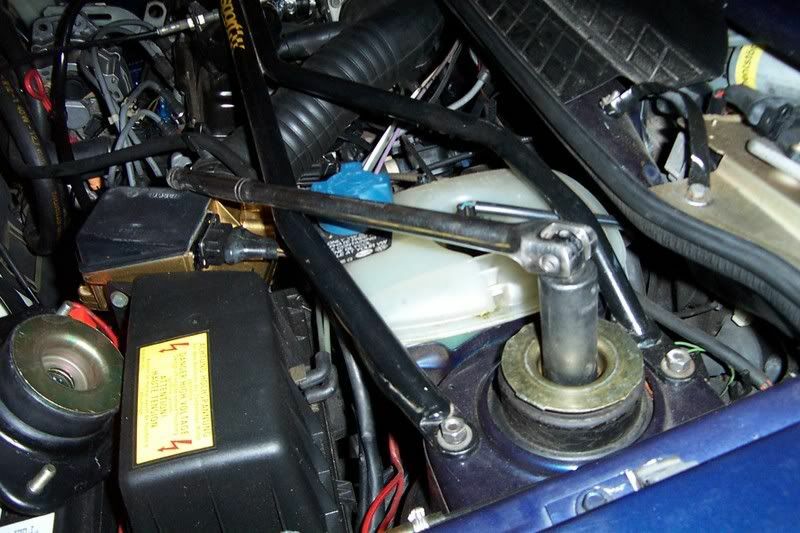 Place the centering collar over the piston, and seat it against the cartridge. 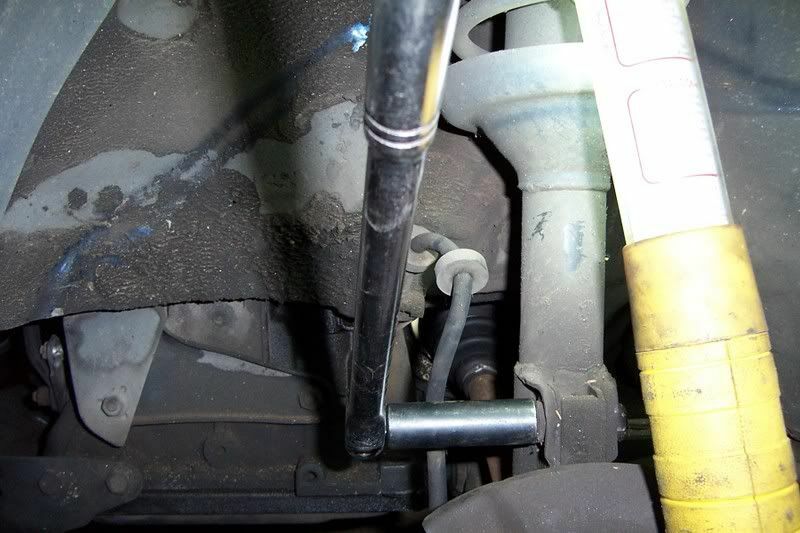 Clean the strut tubes threads, and screw the strut nut on hand tight, as tight as you can get it. 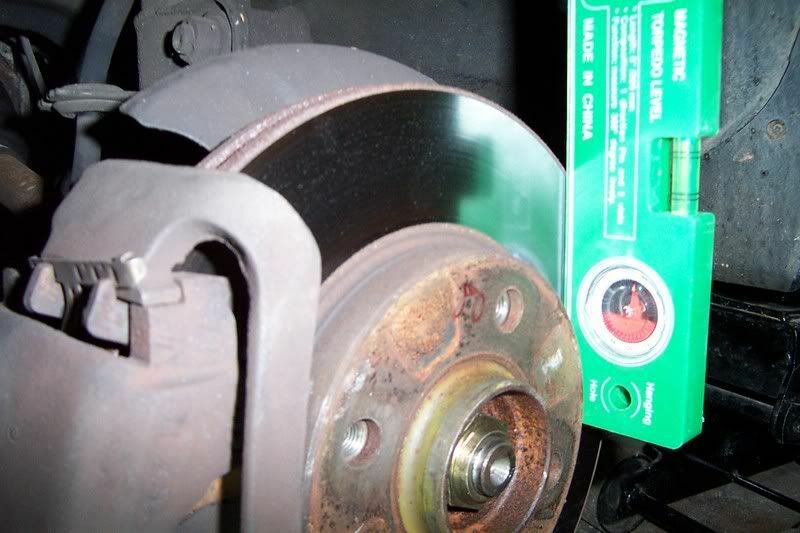 Punch the strut nut in a clockwise direction until it stops moving. 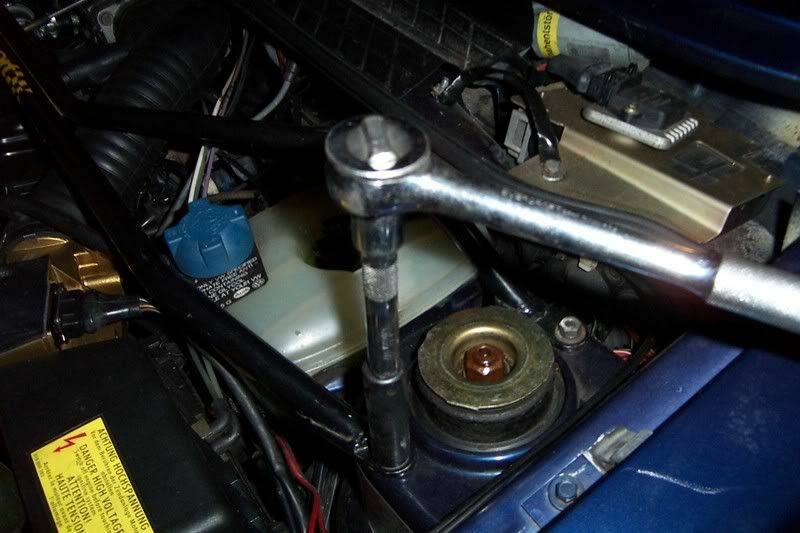 Put the top spring seat, followed by the strut mount, insert the bushing then the washer, and lastly place the nut on the piston and tighten until you can't turn it any more with out spinning the piston. 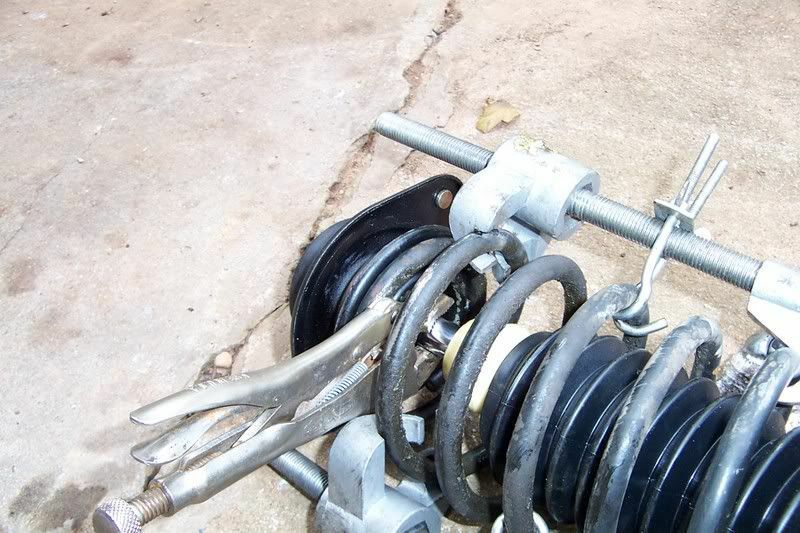 Release spring compressors, equally and remove them. pair of Vice Grips at the very top of the shaft to hold it tight against the concrete, this is in an area where the shock piston never reaches…. With the Vice Grips firmly on the top most of the shaft, you can now tighten the top strut mount to the 59 ft/lbs of torque that you need. Wow you are almost done. Insert the assembly in to the tower, and supporting the assembly with one hand position the strut mount in the holes and pushing up catch a nut on a few threads. 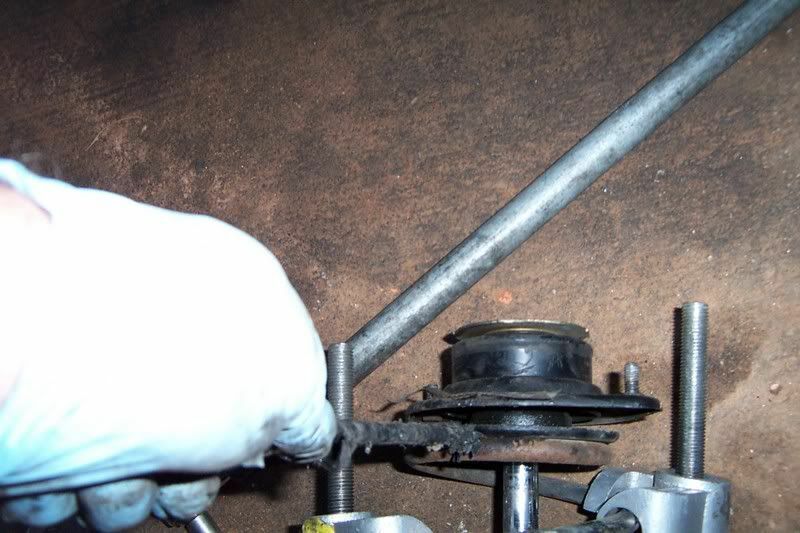 Then place the other nut on the strut mount and tighten fully. 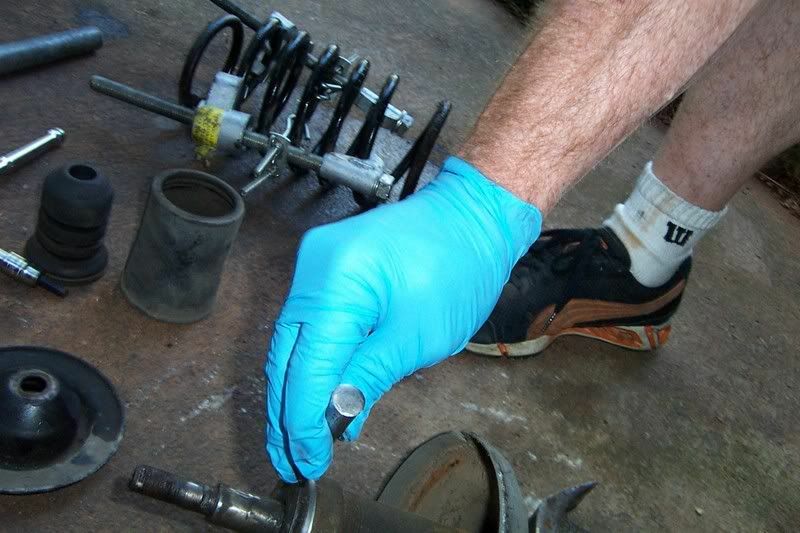 Since you are done with the top, you can place the cap back on if it is too loose, work a couple of O-rings around the center… This will lock them suckers in place…. works great if they are cracked too. Place the bottom two bolts in and tighten a bit. Place your angle finder back on the rotor and adjust the top cam bolt to the desired angle of degree that you measured. 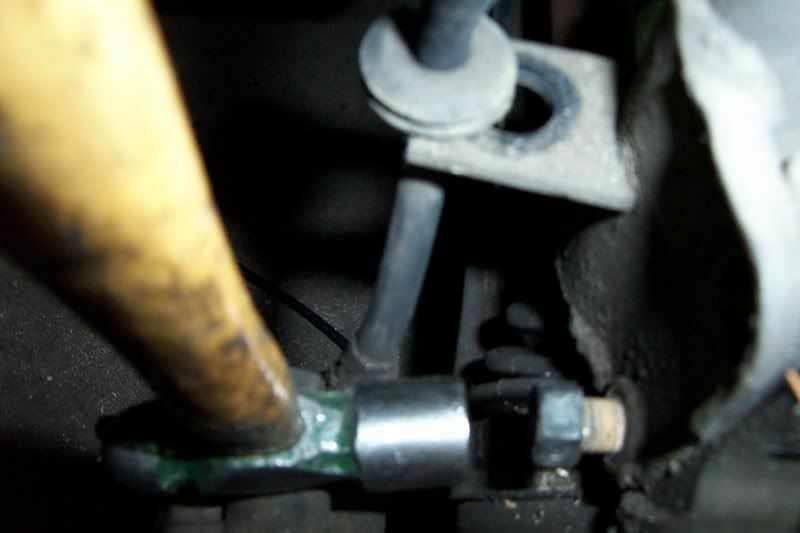 Once you are there hold the Head of the bolt and tighten the nut being careful not to move the angle. 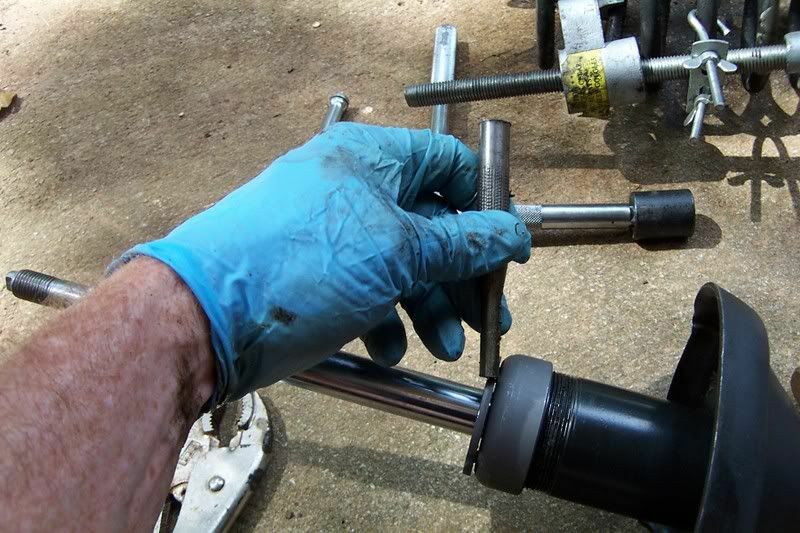 Once that bolt is tight, then tighten the bottom bolt. 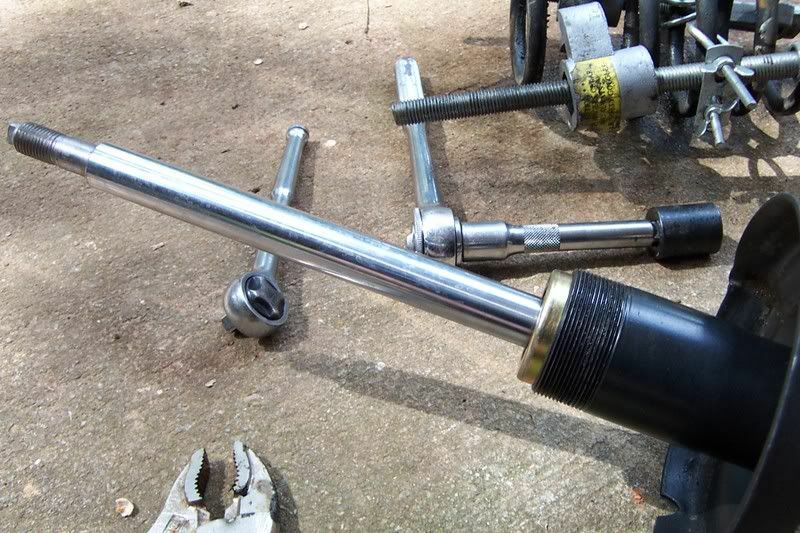 Once you have the bolts tight set the torque to 59 ft/lbs on each.. be sure to back it up.. 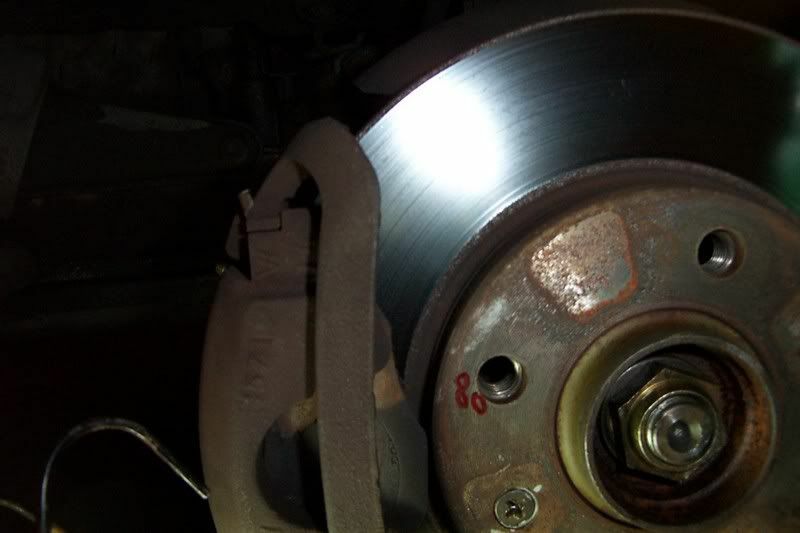 Replace the brake hose in the slot…. 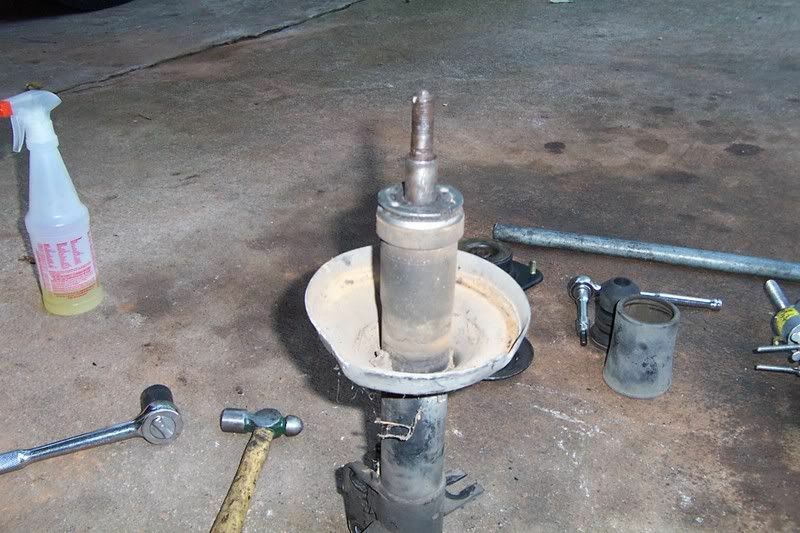 Place the tire on the hub, and tighten all the bolts . 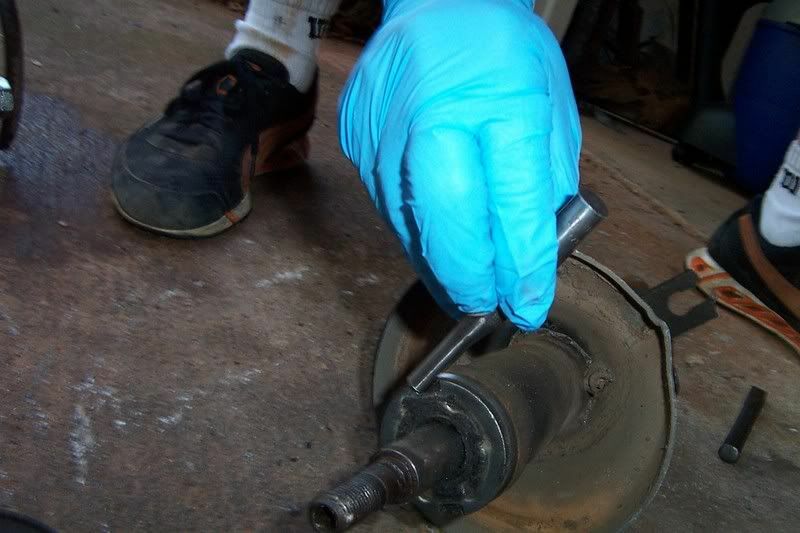 Lower the car, and finish tightening the Lug bolts, replace the center cap, clean up…. Now you know how my Wed’s go…. Thursday I put new mounts on the Green one…. Very nice Brian. Wish I could have come out to give ya a hand. Actually, I might just make some arrangements to bring a certain sticker that you were promised eon's ago once I get back from Denver. I should have my bike back by then and I'll be needing to take it on a nice long ride for a break-in. 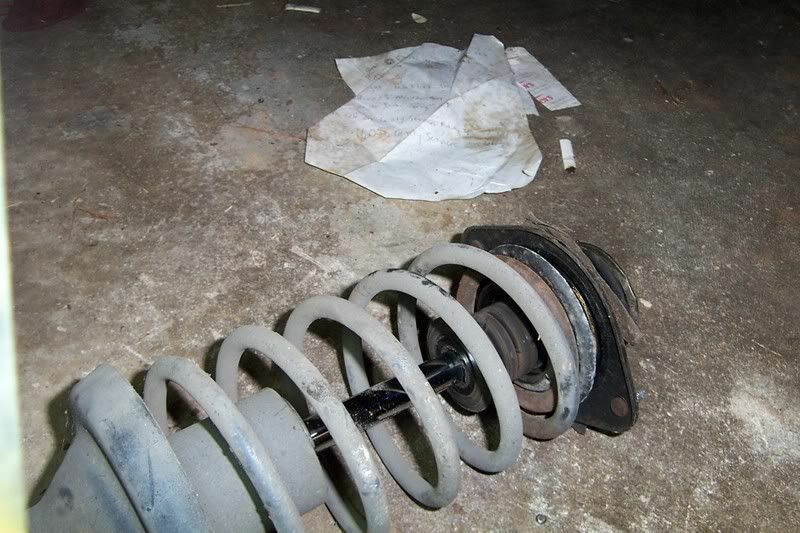 have i been out of it so long that the new strut mount dont look right? there should be a 1/4 inch gap.....................right? 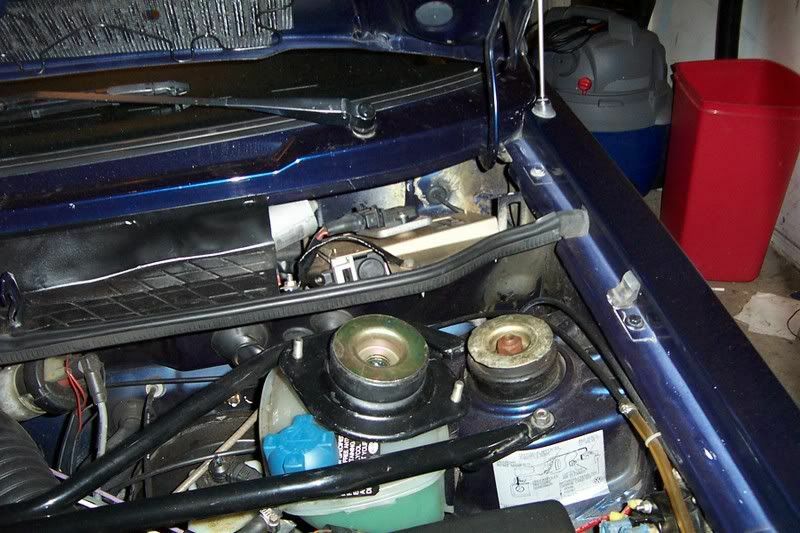 Unrelated question -- what's the Ford starter contactor on the fender for? 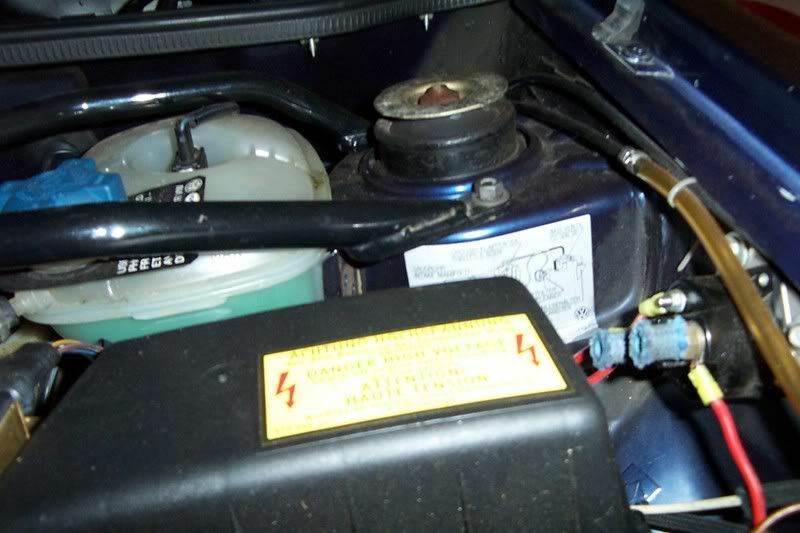 I have an automatic.... That is for heater heat soak issues as it shunts AMPs away from the ignition switch, and allows the starter to draw from the battery directly..
Ah, right. I'd heard of that problem, but somehow it didn't click with me that yours is an automatic. I wouldn't dream of asking you to change it. Actually, I think converting an automatic to a manual should be kind of a last resort. Generally I think it's simpler and makes more sense to just sell the car with the automatic and buy the car you really want, instead of trying to do a conversion. Wow Thanks for the write up and pictures. I have what you fixed so I'm headed that way. 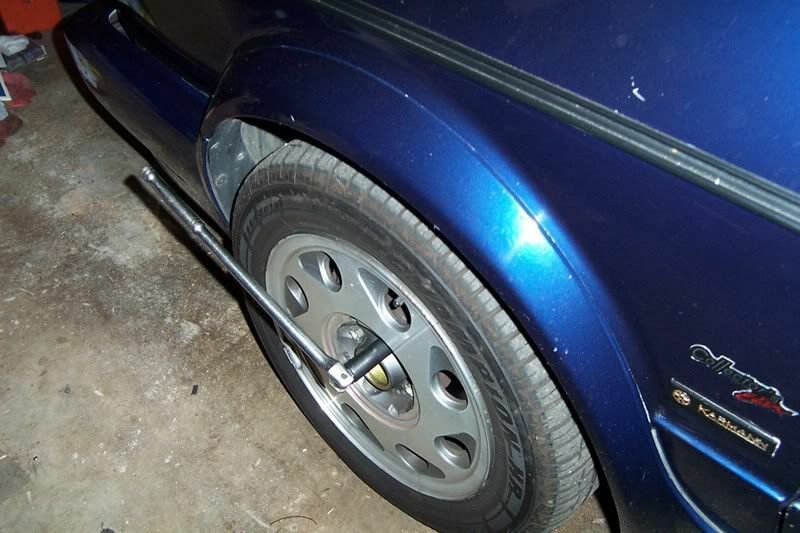 I'll go with the stock struts since it sounds like the way to go. You guys are a world of help. in the how to, you show putting the centering collar onto the piston before securing it with the notched collar. I just received my new Sachs struts today but there was no centering collar included like what you showed. Only the strut, notched collar and nut. 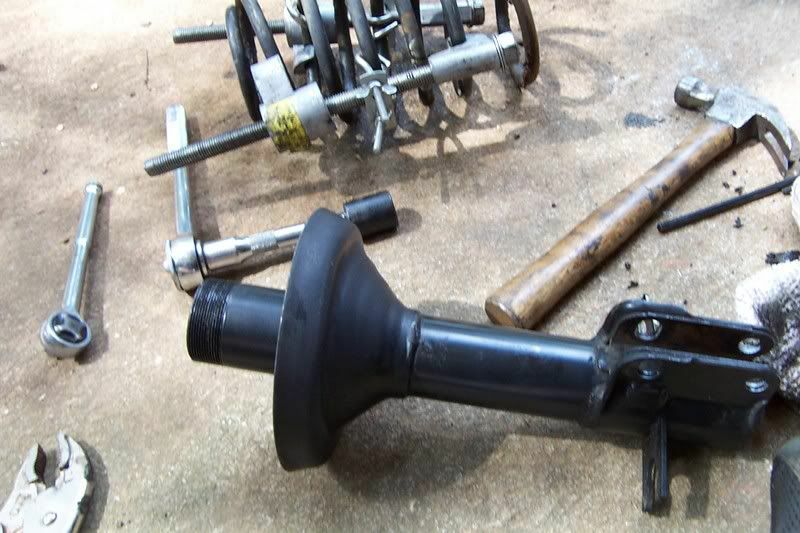 Is there a centering collar in the old strut assembly that I reuse, or is this something I should order separately? Depends on the strut cartridge maker, some that I have used before were inbuilt in to the collar. 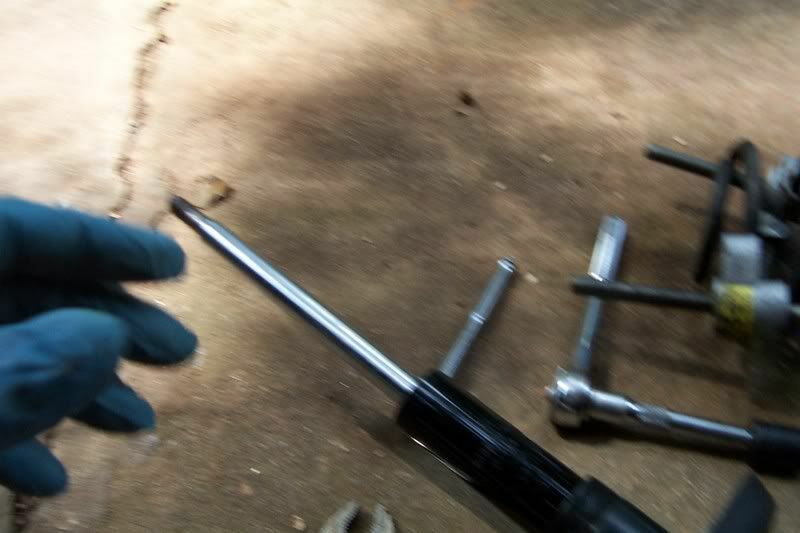 Replace it, tighten it up a tad, then see if there is lateral (up and down) movement in the strut from the cartridge. 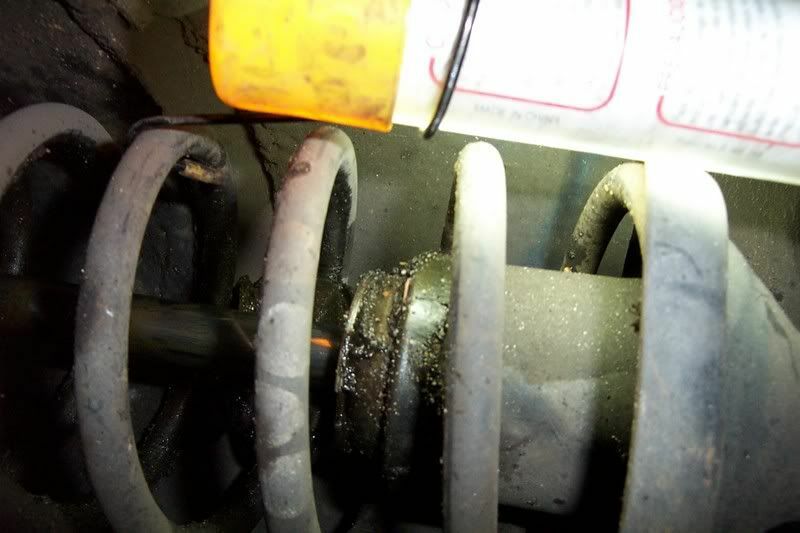 That is you pull up and push down the strut rod, is you hear a thunk or clank, then the strut cartridge isn't locked in place.